“I just want to tone,” she said. And with that, she grabbed her pink rubber weights off the rack and pranced to a small area of the all-women’s section at the gym to complete her ultra-high-rep toning workout. The myth of “toning” took root several decades ago and just won’t seem to die. By now, many of us may have already heard that training to specifically “tone” your body is a myth, but somehow it continues to circulate in gyms across the country and online forums. Here, I’m going to explain why, from an objective, scientific standpoint, there is no such thing as “training to tone.” I’ll also offer a more logical, time-efficient solution for people who are trying to achieve a lean, hard physique without added bulk. First and foremost, it’s important to note that our muscles don’t understand what it means to “tone.” It’s simply not how muscles actually develop. I’ll spare you any in-depth look at the different fibre types (i.e. slow twitch – type 1 and fast twitch type 2a and type 2b), energy sources (i.e. glycolytic, ffa, creatine, atp-pc) and the different hormonal and chemical signals that stimulate growth (i.e. mTOR, testosterone, transcription and gene expression, satellite cells, IGF-1) and skip right into the basics. Muscles do two things – the shrink and they grow. They don’t TONE. When a muscle increases in size, this is called hypertrophy and it’s usually a result of things like the thickening of the muscle fibres in response to the training stimulus. Training hardens our muscles, creating a fuller, more dense-looking appearance that is less squishy or soft-looking (i.e. sometimes referred to as skinny-fat). Also Read: Does Muscle Really ‘Turn Into Fat’ If We Stop Exercising? Most people looking to “tone,” do, in fact, want and need some degree of hypertrophy, but they just don’t want to push it too far. Alternatively, muscles can also shrink – known as atrophy, where the muscle fibre become thin and start to store less intracellular contents, which makes them smaller. This is related to both the training stimulus, as well as the biochemical signals being sent to the receptors on muscles cells that ultimately changes the way muscles look and store nutrients. For example, if you sustain an injury or have to take a layoff from the gym, muscles will typically atrophy 5 to 7% per day of inactivity or immobility. This will produce soft and flabby-looking muscles – not quite “toned,” as it were. Indeed, the idea of “toning” muscles versus simply growing them doesn’t exist. What people are really trying to say is they want to train their muscles to increase density (i.e. hardness), without stimulating excessive levels of hypertrophy and growth (i.e. bulk) while decreasing body fat. Okay, so if “toning” isn’t a thing — but you desperately want that toned “look” (a.k.a, hard muscles and a lean figure) — what do you do? Read on. Anyone that says high reps are for toning and low reps are for bulk hasn’t done their job to stay on top of the latest research in the field. This old way of thinking — high reps for “toning” and low reps for bulk — is highly outdated and not based in science. Can high reps stimulate hypertrophy (muscle growth) if performed with enough effort? Absolutely! In fact, several studies have confirmed that high-rep training with low-to-moderate loads were shown to be almost as effective as heavy-weight, lower-rep training for producing muscle growth. The key element here is EFFORT, not the actual load of the weight. For example: Just say you were to perform a 25-rep set of barbell squats with a moderately heavy weight, where it starts burning after 15 reps and your body wants to stop at 20. You keep pushing, and get the 25 reps with proper form. The set takes around 50 grueling seconds to complete. Now, compare that to if you had you done just 8 reps with a heavy weight, where you probably gotten 15 reps with if you really pushed it. The latter set only lasts about 20 seconds and hardly produces any type of deep burn or muscular failure. Your quads, glutes and hamstrings are probably going to grow more in the former instance than in the latter. Higher-rep training can maximize several key training variables that are responsible for hypertrophy including things like time under tension, lactic acid production and other key chemical signals that are released in response to tissue microtrauma. When it comes to weight training there are few key things to remember when your goals are to harden up the physique without creating too much added bulk. 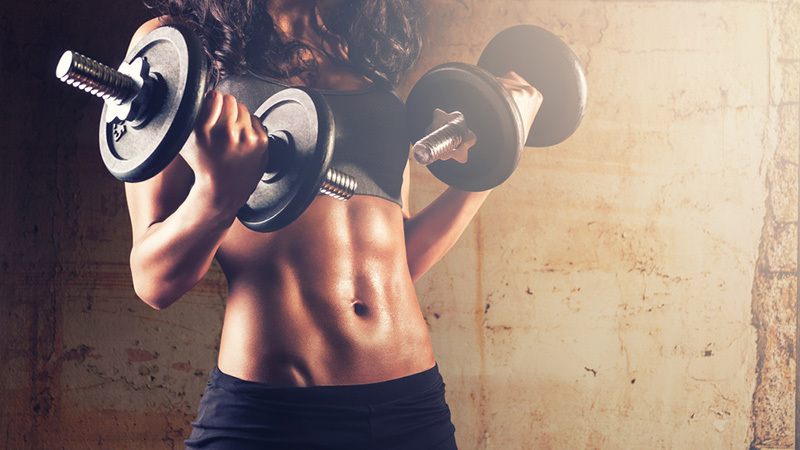 Train to stimulate muscles, not annihilate. What I mean by this is that you should be training with perfect form using a moderate weight, that’s somewhat challenging and pushing your sets to the point where you feel a burn and contractions in the specific area, but you aren’t pushing it to the absolute limits of failure and then beyond. Train hard, but stop just a few reps short of absolute muscular failure where you can’t possibly perform another rep.
Use moderate to high rep ranges. To ensure you’re not selecting a weight that’s too heavy, select a weight that brings you close to failure in the 12 to 25 rep range on most of your sets. This range will allow you to really feel the exercise in the target area, focus on the mind-muscle connection and take time to feel the stretch and contraction phases of each rep. If you complete a set of 17 reps, you may have been able to do 20 or more had you really dug deep and kept going. Save that for the bodybuilders looking to grow! Train using a controlled rep cadence. If training explosively with moderate to heavy loads is a great way to add size to a muscle, then it goes without saying that if bigger muscles is not the goal, you should be performing your reps with a precise and controlled pace. Take 2 to 4 seconds to lift the weight, 4 seconds to lower it and then you can add a little extra time in the contraction position or stretch position where it’s suitable and adds to the “feel’ of the movement. Keep volume in check. Volume refers to the amount of work you’re actually doing in the gym – the number of sets and reps being performed. It’s important to remember that volume is a key trigger for muscle hypertrophy, and your goal is not to add size to a muscle, you may not want to be doing 30, 40 or even 50 sets per workout like I’ve seen some bikini girls doing – thinking, “it’s just light weights,” and then wonder why their muscles take on an over developed look. Fifteen to 20 sets per workout is plenty for the majority of us looking to simulate muscles, without excess bulk. Train with circuits and full-body movements. If you don’t want a specific muscle to grow, then don’t create its own specific day of training! How many times have a seem women training their arms on a specific day because they want to “tone” them so they perform 8 to 10 exercises, 30-something sets, and probably hundreds of reps. A far more effective and time-efficient solution would be to train the entire body in a circuit that stimulates the large muscle groups every few days, and mix in one or two specific movements for the arms somewhere in the circuit. You’ll burn far more calories and the stimulus on the arms would be more of a stimulate/harden signal, as opposed to a size-increasing hypertrophy response. Be careful with bodyweight plyometric based movements. Many people think that if something is done with just their bodyweight, it’s impossible for them to grow and they can only “tone.” This simply isn’t true, and once again, it comes back to effort. That 20-rep set of explosive jump squats can and will build your thighs if it’s done with enough intensity and taken to absolute failure. Your fast-twitch muscle fibres get called upon during any explosive plyometric-based movement and doing too much of this type of training could stimulate hypertrophy in some individuals blessed with a large proportion this fiber type. Do your plyos, but don’t push them to complete failure and take note that even bodyweight movements can build size if our muscles perceive the exercise as new and extremely challenging to perform. The last main issue with this topic of “toning” that I’d like to address the issue of body fat. Here’s the cold, hard truth about looking “toned” – you will never get there if you’re carrying around excess body fat, no matter how much you train. Too much body fat blankets your muscles and masks any type of muscle definition you may have underneath. You simply can’t out-train a bad diet, period. No amount of reps, exhausting workouts or group weight-training classes will give you the tight, hard physique you’re after if your diet isn’t on point and supporting your goals. Most fitness buffs know this by now, and yet I still see hundreds of gym-goers performing endless side bends to “tone” their core. This is a complete waste of time. Train hard to maximize your metabolic rate, harden up your muscles, do your cardio, and get your diet right to get rid of the fat. The training part of I’ve discussed in some detail above, so what’s the best type of diet to produce a lean, hard body? It may be slightly different for everyone, but generally speaking in my practice, it’s been a 40/30/30 type of diet with 40% complex carbohydrates and veggies, 30% lean protein and 30% healthy, essential fats. Eating too many carbs is not usually a great idea for those looking to lean out and look hard and tight. Muscles have a high capacity to store carbohydrates as glycogen, and you wouldn’t really want to maximize your muscles stored carbohydrate reserves if your goal is NOT to get bigger muscles. You’ll also be a little better at tapping into any stored fat when your carbohydrate intake isn’t maxed out. I don’t however believe in restricting carbohydrates for most individuals, because you definitely need some to fuel your workouts and provide a source of readily available high-intensity energy for the day. Keep carbohydrates low to moderate, and you’ll feel better and look a little harder then those trying to restrict to carbs to near zero. For those who are extra concerned with body fat, try to time your carbohydrate intake around your morning meal and pre-and post-workout periods. You’ll need your protein to help delivery a steady supply of amino acids for muscles to use for recovery and maintaining a positive nitrogen balance, which assists in keeping muscles looking hard and tight (not necessarily big). Emphasize variety and focus on more lean cuts of meats, lots of fish, poultry and eggs to help prevent any deficiencies. Whenever you are reducing carbohydrates, it’s important that fats are slightly bumped up as well to compensate, and to provide a sustainable source of energy that will fuel your daily activities and low-intensity exercise. 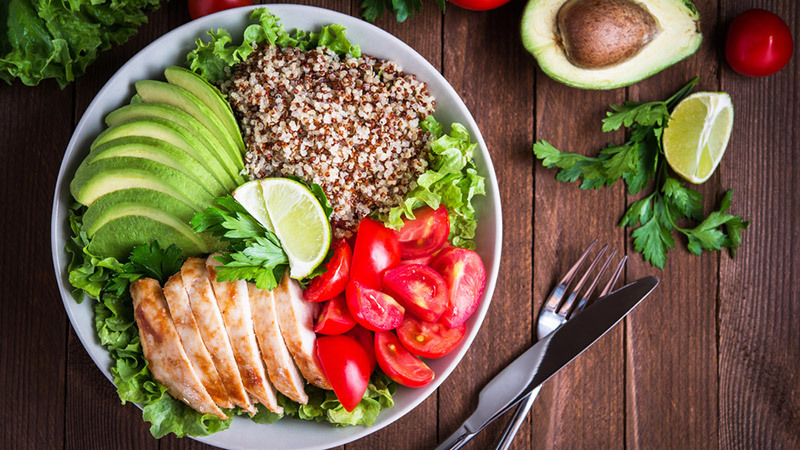 Most meals should contain a source of healthy fats, unless it’s one of your main high-carbohydrate meals – skip the fats for that meal and put them in the next lower-carb meal. It’s all about balance, people. Let’s eliminate this idea of “toning” our muscles and focus more on growing strong and lean with the right muscle-building regime and diet. Rather then criticize those for doing something wrong in the gym, give them some credit for even being in there and maybe (politely) offer a more effective way to spend their time. Enough with the toning: Train hard, eat clean and grow strong.